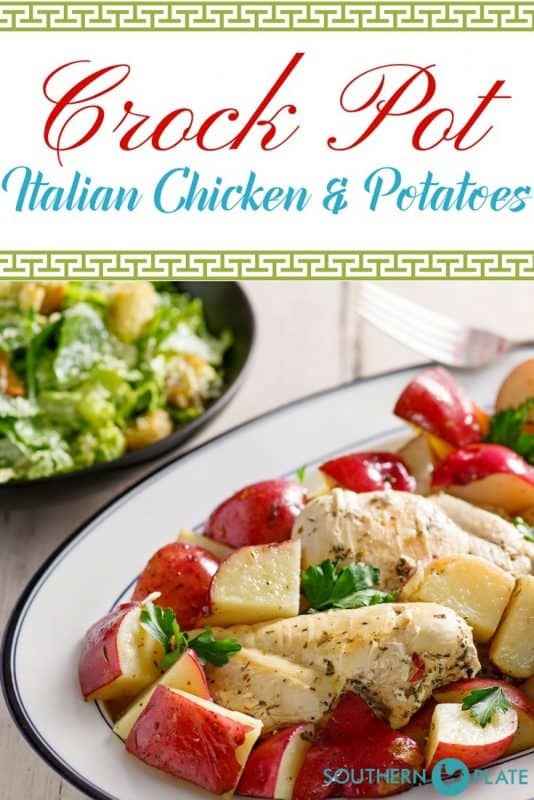 Italian Chicken and Potatoes – A simple crock pot meal! Sometimes we forget that we have staples already in our pantries that can make a everyday dish turn into a sensation for the senses. 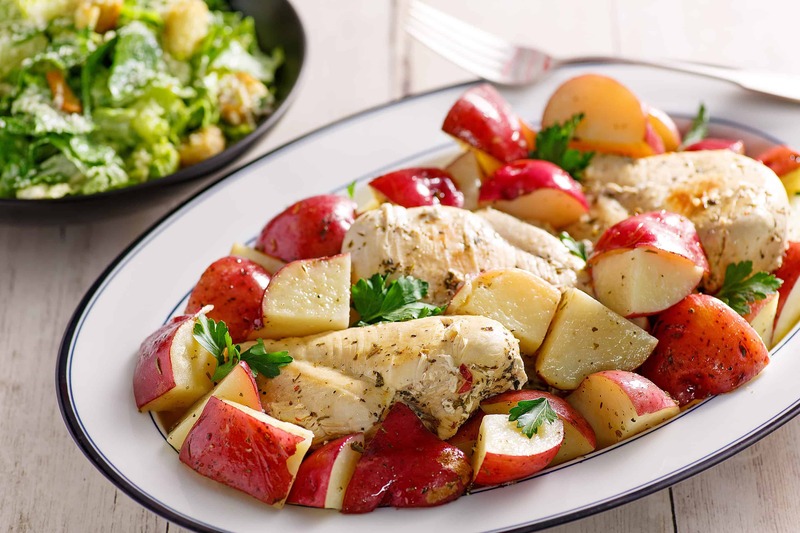 This recipe serves up chicken and vegetables with a juicy pop of flavor. With spring on the horizon, I know we all want to spend more time enjoying the beautiful weather that is coming our way and so the nicer the weather gets, the more I tend to rely on crock pot meals to free up my time in the kitchen. I know some of y’all are still in the middle of winter where you are. While the temps in Alabama have definitely dropped lately, out my window the sun is shining so pretty that I can’t help but feel joy just looking at it. Finding joy in the little things – that’s the way to live! Now let us get in the kitchen and whip up some supper! Oh! If you subscribe to my newsletter make sure you open the first edition of the Southern Plate Gazette that I sent out last Saturday around 9:00 AM central. I’ll be choosing winners from the giveaway in there tomorrow. If you don’t already subscribe to my newsletter, you can sign up at the top of this page in that red bar. It’s free and the best sure fire way to get all of the latest recipes. I’ll be announcing this week’s giveaway in the next edition of the Gazette, which goes out once a week. 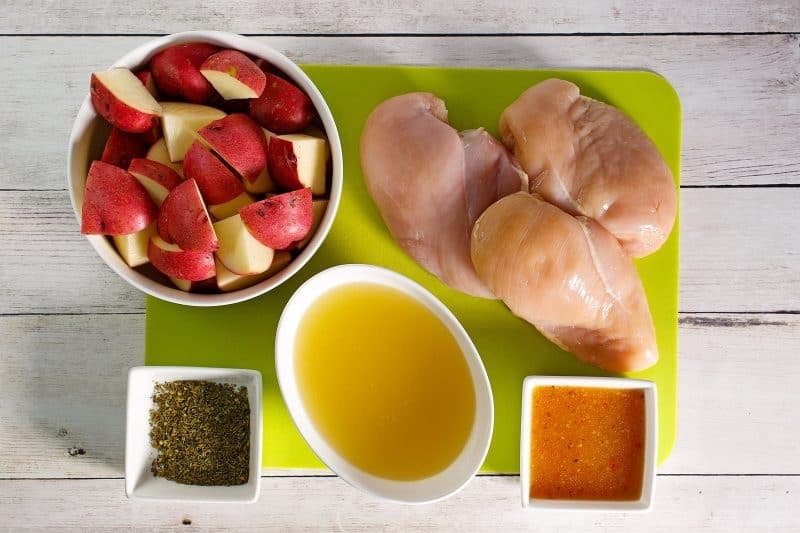 To make this, you’ll need: Boneless skinless chicken breasts (bone in works as well), red potatoes, Italian seasoning herbs, chicken broth, and Italian dressing. I always keep a bottle of Italian dressing in my refrigerator because it can be used in so many recipes and is great for just marinating veggies in, too. Place the chicken in the bottom of a slow cooker (mine is a six quart but a four quart would work). Add the potatoes and sprinkle with the Italian seasoning. Pour the chicken broth and the Italian dressing over everything. Cover and cook until the chicken is cooked through, 7 to 8 hours on low, 3 to 4 hours on high. I like to get more green veggies in by serving this with a little salad on the side. Check out my Super Food Salad recipe for a great salad that can be made ahead of time and keeps for several days in the fridge. Place the chicken in the bottom of a 6-quart slow cooker. Add the potatoes and sprinkle with the Italian seasoning. Pour the chicken broth and the Italian dressing over everything. Cook until the chicken is cooked through, 7 to 8 hours on low, 3 to 4 hours on high. Christy, this looks absolutely wonderful! Thank you for posting! Thank you so much, Jan! I hope you are having a great afternoon! Another good recipe. You are my “go to” for good, tasty, easy recipes . Thank you so much, Blanche! You are so sweet! Grandmothers stoneware where she was always whipping up soups and great meals. I want to try to use it, but my fear is that will it withstand the hours cooking and do I put the cookware in the oven or on the stovetop. Please help me. It’s really going to depend on what that pot is made of and the integrity of it (chips, cracks). So I’m afraid I can’t tell you if that particular pot is a good candidate. I can tell you that you can adapt a slow cooker recipe to go in the oven easily, though. I use a dutch oven that is cast iron enamel coated. 300 degrees for about two hours usually yields about the same result. I’m getting a new crock pot this week myself, as I broke my favorite one last week in a freak accident. They run around $30 and is my most used kitchen appliance. Saves me tons of time and money. I have gotten all my crock pots from the thrift store. Just plug them in at a provided outlet there at the store and wait for a few minutes to see if it heats up. If I purchase a small appliance like that and I am really leery about if it works or not, Goodwill has a policy that you can bring it back in a certain number of days and they will refund your money. I usually just go by the method mentioned above and purchase from a regular thrift store and I haven’t missed with that (I have 3). Another suggestion, pick up a food dehydrator while you’re there. They are usually around 7 to 9 dollars and they come it real handy to dry fruits, veggies, noodles, meat, mittens…oops, didn’t want to go into my other laundry secrets! Christy, I hope you and your family are blessed even more than you already are. You are the light of so many people’s lives. I thank God for you. I am going to put this in to cook right now. Perfect for what we needed today! Thank you! Thank you Lucy!! I hope you enjoy your meal!! for all your wonderful recipes. Looks fabulous! Love crock pot recipes all year long! So, I am subscribed and get your emails all the time, I thought…but didn’t receive any emails from you on Saturday?? Wondering what happened! Check your spam folder or promotions tab, that is usually where they get hung up. I just pulled up your email profile and it looks like you opened it so hopefully you found it. Thank you for being here, Susan! You’ve stuck with me a long time! 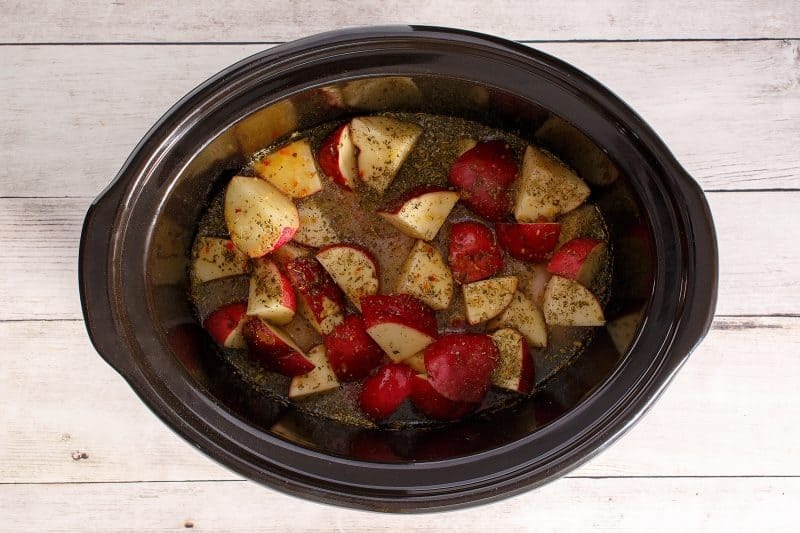 Love simple crockpot recipes, looks like something my family would like. Oh, my! This looks just wondrous! 🙂 We have friends whose husband has a peanut allergy, and when we have them for supper I’m always nervous because “peanut allergy” doesn’t mean just peanuts! I look for things that are tasty but made with a minimum of ingredients. This recipe will fill the bill beautifully. Thanks a million, Christy! Recipe looks delicious! I do not own a crock pot but will use your tip to convert to a Dutch oven and bake it in the oven. I just made this the other night for supper and it was wonderful, so full of flavor. Thanks for sharing this yummy meal. Just put it in the crock pot. Can hardly wait! One word says it all Fantastic. What I love most about this recipe is that the ingredients really are regular normal items that I usually have on hand! You see if I have to go out and hunt down a “unique” ingredient, I just will not do it. I spend my days joyfully chasing my 21 mo old grandson, so I love slow cooker meals. This looks so tasty! I plan to try this tomorrow, and add green bean as a side. By 6:00 pm, I will be the queen of supper time. Simple. Satisfying. Supper. Thanks Christie. I don’t like hunting down unusual ingredients either Sherry, which is why I always try to use easy, every day ingredients! That is such a fun age, I imagine you have the best days!! This was a big hit with my sweet hubby! And I made those delicious baked parmesan zucchini sticks too. yummy. What a wonderful pairing!! I am so glad to hear it was a hit!! This looks good but those velvet pork chops on right sidebar look amazing! I’ve been fixing supper for Mom/Dad (since her hospital stay) and both these recipes fix my quick and easy requirement. Thanks so much! Sending Get Well wishes to your Mom, I know she is blessed to have you as her daughter and making sure they are both being taken care of!! Love this Christy. I might have to throw in a little sausage because I have that on hand. The only thing I don’t have is the Italian dressing, but I have the ingredients to make some. I will have to try your salad as well. Update: This is ABSOLUTE HEAVEN. As I said, I didn’t have the dressing, and when I went to put this in my crockpot I didn’t want to make it so I just used olive oil. 4 tablespoons on top of the chicken and then 4 tablespoons on top of the potatoes. I sprinkled poultry seasoning, salt, garlic powder, and a little chili powder on the chicken and added the cup of chicken broth and added the diced andouille sausage. I then added sliced onions and topped everything with the potatoes and put more poultry seasoning. When it was done cooking I strained out one and a half cup of the juices and mixed it with a packet of Pioneer biscuit gravy mix, plus an additional half cup of water. Really GOOD gravy to serve on top of this chicken and potato deliciousness. Now, if anyone is reading this and going “Eww, gravy mix! How uncouth”, I say, don’t knock it, until you try it. Thank you for another great recipe Christy!!! Looks good. Just got all of the ingredients in the Crock-Pot and got it going. made it a little bigger than the recipe so I added a little more chicken a little more broth a little more Italian dressing and a little more Italian season. can this be made in the insta-pot ? I am sure it could. I can’t really give you advice on times and such but would love to hear how it turns out. Once again you have given us a wonderful recipe, easy and delicious. I am so glad you liked it Phyllis! !